I like getting out of London and breathing in the fresh air and soaking up the beautiful UK countryside. I like it even more if the main purpose of my country excursion involves food! And on this occasion it certainly did. Sure the fields of rolling green, sheep grazing, and the smell of spring flowers was nice but the food and ambience of The Olde Bell in Hurley was stunning. 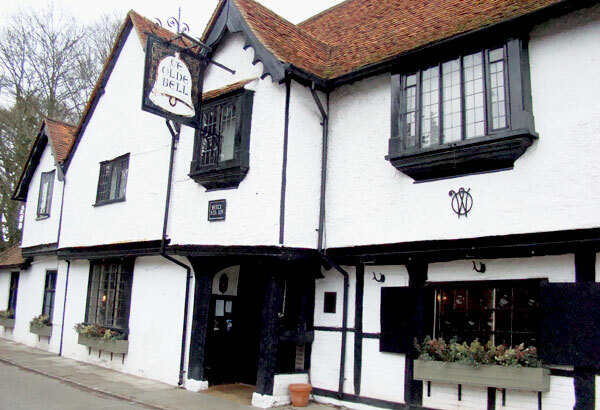 Under an hour’s drive out of London, The Olde Bell is in the lovely village of Hurley, Berkshire. 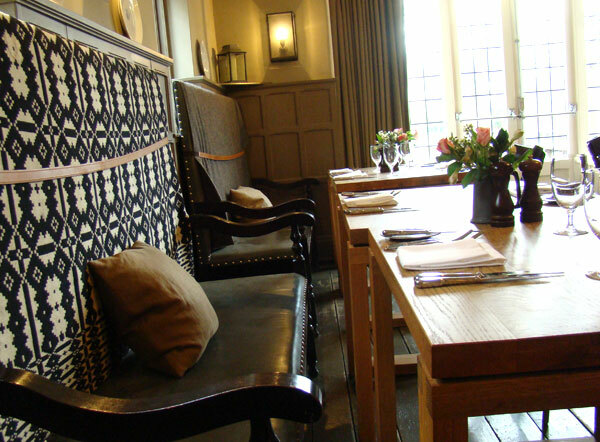 The historic timber framed building built in 1135 has been lovingly restored into a modern coaching inn. All of the old charms of exposed beams, open fire places, unpolished floor boards are brought out with modern minimalist touches. It truly is a gorgeous building and caters for eating, drinking, gathering and also staying the night. 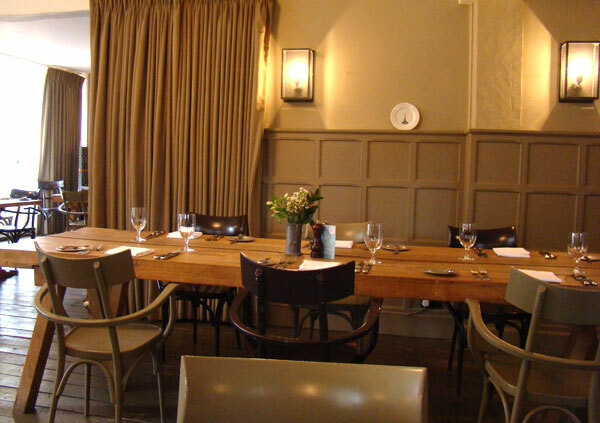 Seated in the dining room the feel is rustic with solid timber tables, leather banquettes lining the walls with woollen throws decorating their backs and garden posies on the tables. It’s a spacious room with views out of large glass double doors to the grassy lawn and country garden which seems to go on forever. We were already planning our return visit in the summer when we could presumably be seated outside. The menu at The Olde Bell is frustrating. Frustrating because I wanted to eat everything. There was a set lunch menu which was incredibly well priced at £16.50 for 3 courses. We could have easily settled for this, but the range of choice on the a la carte was too much to resist. And at £29.50 for three courses the hardest thing we had to do was make our selection. 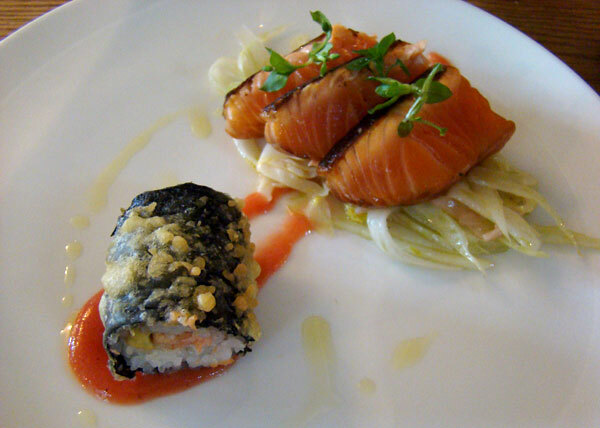 I started with the crisp cured salmon which was on a bed of crunchy fennel and strips of pickled ginger. The salmon was perfect, only just having kissed the pan. A great contrast of texture with the fennel and the flavour given a sharp finish with the pickled ginger. I could have even done with some more ginger. A tempura salmon and avocado sushi roll was super fresh and a tasty accompaniment. 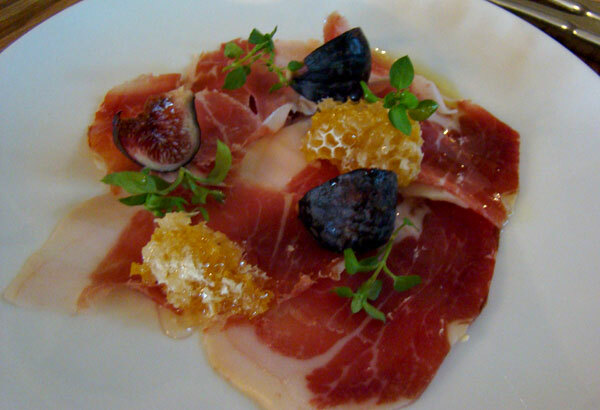 Another stand out starter was the iberico ham simply served with fresh fig and sweet and chewy honeycomb. A gorgeous combination. The mains were adventurous, seasonal and truly exceptional. 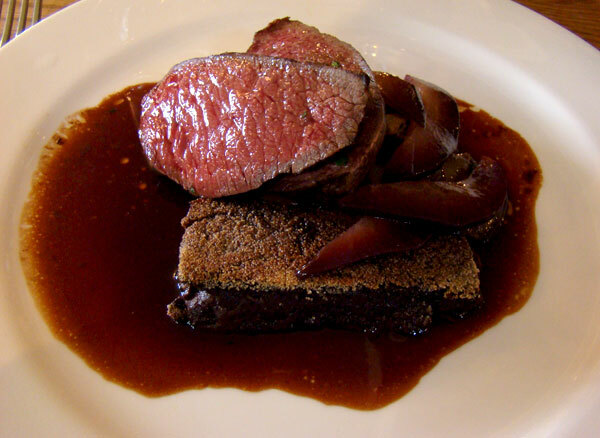 I couldn’t go past the venison with bitter chocolate polenta cake. Pink and melt in your mouth the venison was amazing. With a crusted top the chocolate polenta was bitter and rich and went so deliciously well with the venison. Port roasted pears actually rounded out the palate and the thyme roasted salsify was subtle in flavour but added a touch of sweetness. This dish ran the risk of being too rich, but it was actually perfect. 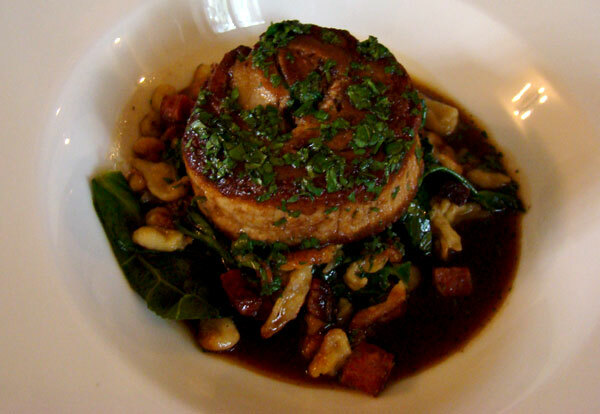 The pork belly melted in your mouth, a result of being slow cooked to perfection. With only a trimming of fat is was definitely generous on the meat side. Served with spaetzle pasta and chorizo and in a light gravy you could not go wrong. 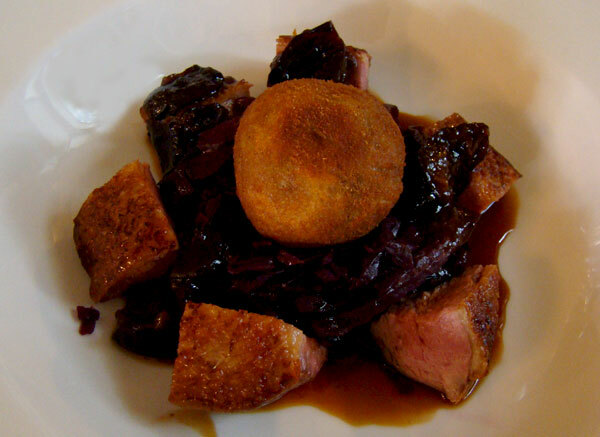 Tender chunks of duck breast were complimented with red cabbage and soft prunes. The duck leg croquette was a nice touch and particularly delicious. And then there was dessert. Thankfully I have a second stomach reserved just for pudding, there is always room. 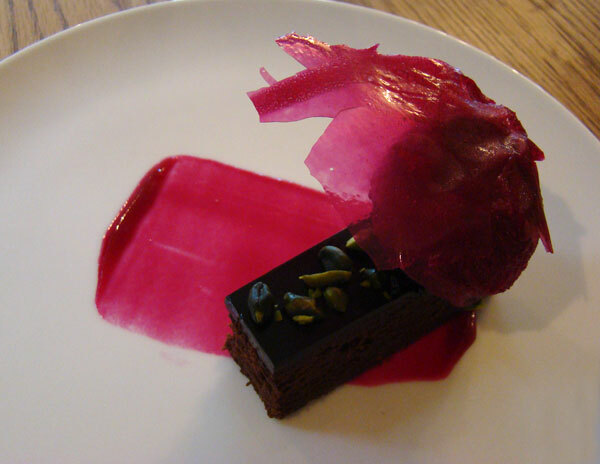 A rich velvety baked chocolate mousse was seriously rich but was brought together with an earthy beetroot sorbet to balance the palate. And the presentation exquisite. Unsurprisingly I couldn’t go past the rhubarb soufflé. It was like eating airy, spongy bubbles of rhubarb gorgeousness. 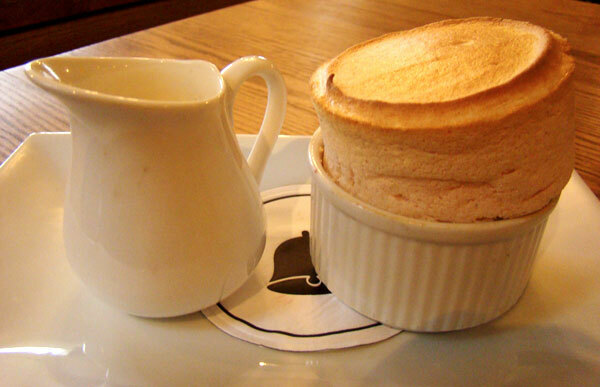 There was a lot of tarty rhubarb packed into that soufflé – amazing. And so we left The Olde Bell, first having a stroll around the surrounding fields and country lanes, already planning our return visit. The fact that they have rooms to stay is a very tempting offer indeed. I wonder what breakfast is like!